Smallholder farmers in some farming communities in Ghana have appealed to the government to reduce further the prices of inputs under the Farm Input Subsidy Programme (FISP) and make them easily accessible. The food crop famers said under the FISP being implemented by the Ministry of Food and Agriculture, (MOFA), under its Food Security and Emergency Preparedness Programme, prices, particularly of fertiliser was still high for them to buy. Consequently, they were not benefiting fully, although the programme was targeted at them. They said if they are expected to improve productivity to ensure food security and enhance livelihoods, as well as improve the sector’s contribution to Gross Domestic Product (GDP), then the reason for introducing the subsidy should help their cause. An interaction with some smallholder farmers in the Upper West Region under the auspices of the Ghana National Learning Alliance under the Sustainable Agricultural Intensification Research and Learning Africa (SAIRLA), showed they are aware of the FSIP and they mostly benefit from fertiliser under the three. However, they complained about the prices, accessibility and timing of the release of the subsidised inputs which affects the amount they can afford. At Ko in the Nandom District in the Upper West Region, most farmers produce crops such as cowpea, sorghum, millet, yam and groundnut. The Ko Naa, Naa Domepeeh Gyereh III, said due to the above stated issues, many farmers in the area may not want to use fertiliser at all. “With inorganic manure, if you start using and at a point you stop applying it on your farm, you don’t get the same value in yields. So, most of us have gone into rearing of animals to enable us produce adequate compost / manure which we believe is able to maintain soil fertility over a longer term ,” he said during a visit to the area. A farmer, who caters for a household of seven people, Mr Vitus Beweleyir, said he can afford some amount of fertiliser which he buys through the unit committee in the area which he uses alongside the compost he is able to produce. “Well, it has been beneficial so far. In 2017, there was a delay in release but 2018, it came on time. I don’t use tractor services because I want to do minimum tillage, so the soil nutrients won’t be destroyed,” he explained. Another farmer in the area, Mr Gregory Kelle, who cultivates about five acres farmland said he used his own produced compost more than the subsidised mineral fertiliser. “If you apply the compost, it can maintain the soil nutrients for three years but if you use the mineral fertiliser and you don’t continue applying you won’t get same yield,” he stated. The farmers are faced with the same challenge of affordability. Naa Gyereh III said local seeds, (which are selected out during harvesting) was preferred because they assume that fertiliser use and hybrid seed must go together. At Kalsagri in the Lawra Municipal Assembly in the Upper West Region, the Regent, Baanye Kaara-ib, said farmers in his area registered for coupons that qualified them to receive fertiliser and pay in installments. Seeds, he said arrived late and so most do not use. Another farmer, Denuru Kuukorah, said that most of the tractor services that flooded the area during the farming season were from the southern belt, particularly the Brong Ahafo Region which makes demand higher. Therefore, due to non-accessibility and affordability, land preparation was still a challenge as the smallholder farmers are still dependent on the hoe and cutlass for farming. 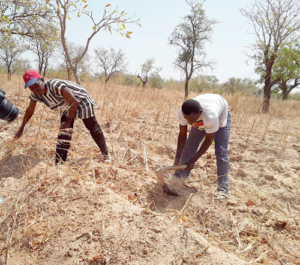 Naa Gyereh III said animal ploughing was preferred since it was less costly, does not dig deeper and helps farmers to practice agroecology (the adaptation of agriculture to natural conditions and cycles and to local needs). A 33-year-old farmer at Tanchara in the Lawra Municipal, who cultivates a four-acre farmland and heads a household of 12, said he benefited from the subsidised fertiliser. “I use the fertiliser together with the manure I produce. I apply the manure before planting and fertiliser three weeks after planting because I believe the manure moisturises the soil,” he said. Some stakeholders including the Peasant Farmers Association of Ghana (PFAG) have often asked for strict enforcement of the law against smuggling and punishment for persons caught trying to smuggle fertiliser outside the country. The PFAG also advocate an extension of the fertiliser under the FISP to the dry season to cater for farmers on irrigation projects. Also, the limited nature of retail outlets, farmers say increase transport cost for those who live far away from the retailers. The basic idea for the FISP was to cushion smallholder farmers whose use of fertiliser would have been minimal or nil and so, the programme has focused on reducing the cost fertiliser to farmers to increase its use. At its introduction in 2008, there was a 50 per cent subsidy component which declined to 21 per cent in 2015, representing a reduction of about 58 per cent. In 2019, about 13,000mt of subsidised seeds for priority crops (cereals, legumes and vegetables), and 200,000 bundles of cassava planting materials; 438,900mt subsidised inorganic / mineral fertiliser and 30,000mt of organic fertilisers will be distributed. It is estimated that the distribution of the subsidised inputs to the farmers will translate into a total of 1.2million mt of additional production of cereals and legumes. In 2018, a total of 183,000mt of fertilisers, 7,600mt of seeds and cassava planting materials were distributed across the country. The farmers have prevailed upon the government to live up to the objectives of the FISP to increase subsidies on marketing prices of fertilisers, seeds and other agrochemicals. They said government support should also consider going into helping them produce their own compost and manure, especially, water sources and transporting of the compost to the farmland to apply. The Deputy Director at the Nandom District Assembly, Mr William Safo, said since most of the challenges associated with the inputs was administrative; timing and pricing (women smallholders cannot afford), government should try to resolve it. “They start preparing in May for June main season and so if inputs come in July, while rain pattern can’t be predicted, they sow late and which affect yield,” he said. The Lawra Municipal Assistant Coordinating Director, Mr Cletus Chevure, said although they share in the responsibility to inform farmers about the existence of the input subsidy, extension services remained a setback, and so should be looked at. The Deputy Executive Director of the Centre for Indigenous Knowledge and Organisational Development (CIKOD), focused on promoting sustainable agriculture, Mr Daniel Faabelangne Banuoku, corroborated the need for extension services to aide in fertiliser application to avoid under dose and over dose. He recommended that the FISP be looked at to consider organic fertiliser under the programme. “If we can try to rope in more local producers of compost into the scheme. Labour, water and transport make it difficult to produce compost so, if the system can look at that by helping farmers get compost as they get access to chemical fertiliser, it will be good,” he explained. The General Agricultural Workers Union (GAWU), has maintained that subsidy was a prerequisite for food security and at the same time efforts must be made to help create ready market for agricultural products to prevent post-harvest losses. Some studies have recommended that the programme needed a clearer strategy on how to target women. the challenges associated with the inputs was administrative; timing and pricing (women smallholders cannot afford), government should try to resolve it. This article was originally published on Graphic Business (https://www.graphicbusinessonline.com/agric/smallholder-farmers-want-more-subsidy-on-fertiliser) and is reproduced here with kind permission.